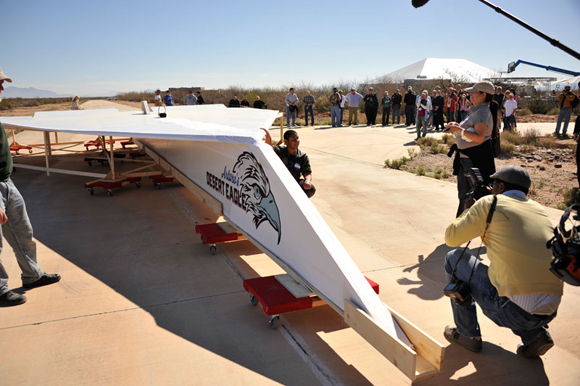 An Arizona aircraft museum reckons it has taken the record for the launch of the biggest ever paper plane: a 45ft (13.7m) long monster which glided to Earth last week from a height of 2,703ft (824m). Pima Air & Space Museum's hefty 800lb (363kg) Arturo's Desert Eagle needed a helicopter to haul its 24ft (7.3m) wingspan off the ground, but video of the release indicates it really did fly at up to 98mph (158km/h), even if footage of what we imagine was a lively landing isn't yet available. The aircraft was named in honour of Tucson lad Arturo Valderamo, 12, (pictured below with the Desert Eagle), who won a competition organised by the museum, challenging six-to-14-year-olds to fold and fly a paper plane as far as possible. Arturo's Desert Eagle was constructed from "paper-based graphic board" Falconboard, which is made up of "an engineered paper core and water-based adhesives". Disappointingly, the aircraft's structure appears to contain no paper straws whatsoever.